When he lived in the Bay Area, Andrew Freinkel practiced psychiatry at Stanford Medical School and researched complementary treatments for brain cancer -from which he, himself, was recovering. 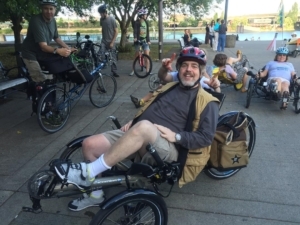 In 2011, Andrew brought his custom-painted Catrike Villager with him to Portland. But, when persistent neuropathy required both a change in feet position and the addition of power-assist, he upgraded to an HP Velotechnik Scorpion Plus with GoSwiss Drive hub motor. While the path wasn’t always smooth and required multiple pedal/shoe combinations, Andrew weathered it all with determination and a wicked sense of humor. His favorite ride takes him from his Museum-district home to Southeast Portland. When the weather’s clear, you’ll see him on the Hawthorne Bridge or out on a ride organized by our shop mechanic Louie Berry.